The final phase of the Nicklaus North development, Cypress Place, commenced sales on January 31, 2010. The Burrard Group’s 39 single family lots were released for sale representing the culmination of the Nicklaus North community master plan in Whistler. The Nicklaus North Community features high quality single family homes, multifamily homes, restaurant & lounge, golf shop and clubhouse centered around Green Lake and the award winning Nicklaus North Golf Course. The Cypress Place site features level, larger than average lots with sunny, southern exposures and 360 degree mountain views. Its central location provides easy access to the valley trail network, cross country ski trails, a recreation centre and Whistler’s transit system. Cypress Place is located along the 5th fairway of Nicklaus North, providing views across the fairways and preserved natural habitat of the golf course. There are a number of promotional incentives currently offered by the developer including geothermal heat exchangers, golf course membership and option to purchase a mountainside covered parking stall for skiers. “Cypress Place is not only the last chance to own in the prestigious Nicklaus North community, but it is also the greenest single family home choice available to the consumer,” says Jason Wexler, development manager for Burrard Group, “Cypress Place features geothermal heat exchangers, an innovative storm water management system that filters site generated storm water and recharges the natural aquifers, retention of natural vegetation and habitat and proximity to the improved valley trail network, which provides the homeowner with the opportunity to cycle or walk to all of the nearby amenities, thereby reducing their carbon footprint. Coupled with the Whistler Green elements in the design guidelines, Cypress Place promises to be the most sustainable detached neighbourhood in Whistler.” This aligns well with the Resort Municipality of Whistler’s 2020 plan to become the most sustainable municipality in the world and to play host the world with a green Olympic Games. Cypress Place is located west of highway 99, at Nicklaus North Golf Course, just south of the River of Golden Dreams and the Meadow Park Sports Centre in Whistler. The site is approximately 2 minutes north of the Whistler Village centre. More information about Cypress Place can be found on its website at www.cypressplaceliving.com. Burrard Group has operated in BC since 1987, building a diverse portfolio of successful master planned communities, multi family and single family residential developments, commercial space, resort hotel properties and golf courses. 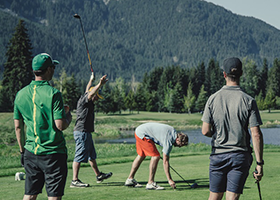 A recognized leader in the development of residential golf communities, Burrard Group has developed several award winning communities including Gallagher's Canyon in Kelowna, Arbutus Ridge on Vancouver Island and Green Lake Estates in Whistler featuring Nicklaus North Golf Course – a Jack Nicklaus Signature Design; part of the GolfBC Group. Burrard's attention to detail and commitment to quality have garnered over 40 industry awards, including Best Residential Development, Builder of the Year, Best Customer Service, best technical innovation and many more.